Tan shoes make such a lovely complement to grey flannel, don’t they? And we know why the socks are green. But of course the most beautiful thing here is the lines of the shoe. The tight waist that causes the sole to virtually disappear in the middle. The way – in profile, as below – you can see how that waist perfectly follows the shape of the foot. Some high-end RTW lines, such as Deco from Gaziano & Girling, cut a very tight waist too; but they can never follow the shape of the foot in the same way as bespoke. This is my second pair of bespoke shoes from Tony Gaziano. The first were slip-ons, made out of a single, seamless piece of hatchgrain leather. They were lovely, and continue to wear well, but having slip-ons as the first pair was a mistake. Hard as it is to accept when you’re paying thousands of pounds, the fit is always better on the second pair, and slip-ons are particularly difficult given there’s no means of adjustment. It was the same with my second pair of Cleverleys, the imitation brogues. This G&G pair fits beautifully. The key to good fit in a shoe is to be held tightly around the heel, ankle and instep – so there is no slip at all when walking – and then loose enough in the front to allow the toes to move freely. 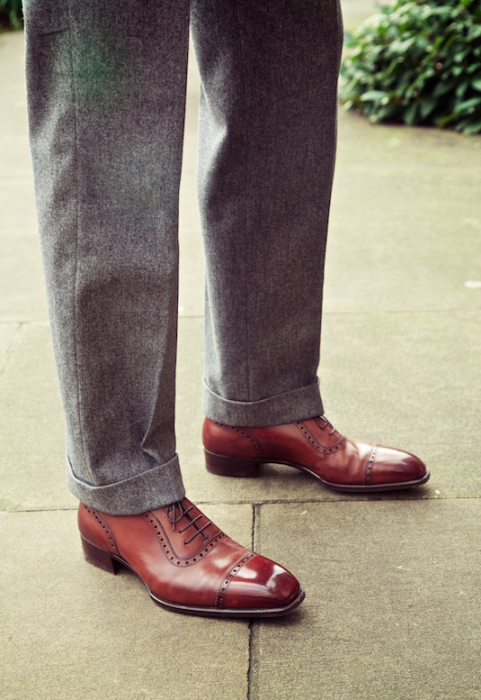 The difference you notice with good bespoke is the way that hold at the back is achieved: the pressure is uniform all around the heel and ankle, and particularly in the arch due to that perfectly shaped waist. Indeed, the fit felt so good that I took them to Pitti in January after only a couple of wears. And they performed admirably, with no discomfort, despite 14 hours or so walking and generally on my feet. The difference I described before between Gaziano & Girling and Cleverley holds true here as well. The G&G shoe is much more similar to Northampton peers in its weight and thickness of leather. Cleverley is very lightweight by comparison. This G&G model is the St James II: a half-brogue Adelaide (the latter connoting the U-shape around the laces), vintage cedar. Current G&G price is £3000 plus VAT. You can follow the discussion on Gaziano & Girling bespoke Adelaides by entering your email address in the box below. You will then receive an email every time a new comment is added. These will also contain a link to a page where you can stop the alerts, and remove all of your related data from the site. I notice an unusual wear patten on the bottom. Straight down the middle. Is that a bespoke thing I.e supporting the sides of the feet better or just your walk? It’s just because there was some rain on the pavement that day. What difference does that weight make? Does it make G&G’s much superior to Cleverley? Hope you are well. I am a big fans of Edward Green and currently have 3 pairs with all 888 last. However, i am keen to get my first Bespoke shoes right now, GG’s price is a bit too high for me, any other choices you can recommend for me as my first pair? There aren’t any bespoke shoe alternatives I could recommend that are much cheaper I’m afraid. Unlike tailors…. Really nice shoes — especially the way the waist cuts in. How dark a suit would you pair those shoes with? Both in terms of blue and grey? These are truely stunning. Thanks for sharing! You, Sir are one very lucky man. What a beautiful Shoe that is. Drat. I had planned to save the money from my income tax refund this year. Those are absolutely stunning and match with the grey and green combo perfectly. I wish I would’ve made a similar “mistake” getting a pair of those hatchgrain loafers! These are some of the most beautiful shoes I have seen. I have a general question regarding shoe quality. 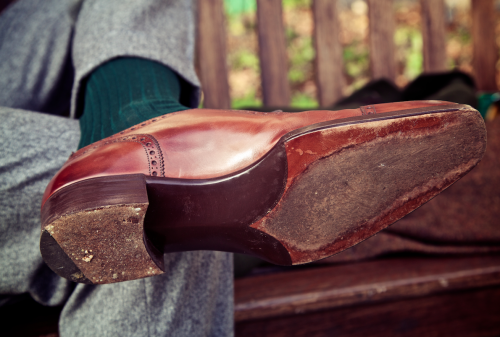 I read again and again that well build shoes, if properly maintained, can last a lifetime. How can I tell if a pair of shoes fall in this category? Price is not anymore a good indicator in the RTW market. A lot of shoe-brands (specially with this “re-branding” fashion) and designer-brands now sell shoes with prices starting at 300 to 600 euros. “Goodyear Welt,” “Goodyear Flex”, etc. are sometimes mentioned. However, if I go to a store, take the shoes in my hand and look, e.g., at the sole, I see a big difference in build and materials for similar prices, even within the same brand. Are there key features that reveal how well the shoe was build? Can all shoes be refurbish/re-soled? There are a lot of things that go into this. Some of them can be assessed easily (e.g. Goodyear welt); others are much harder (quality leather). 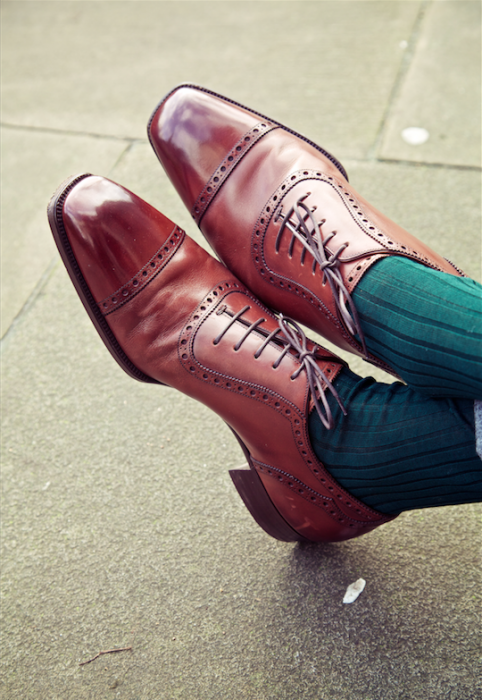 One thing certainly worth saying though is that English shoes generally deliver value for money – you get what you pay for, from £200 shoes to £2000 shoes. And avoid designer brands (Gucci, Prada etc) because it is obvious that much of the price goes into marketing and catwalk shows, rather than production. Lovely shoes Simon. I also really like the fit of your trousers. Can I ask who made them for you? I think their RTW trousers are about £350 but what would they charge for bespoke? Lovely, did you ask for them to be very much less stylised than G&G’s normallly are? Still not a very large welt though, what is the reason for hideously large welts on lots of RTW shoes? Are Wildsmith (they are goodyear welted), value for money? Very, very nice. Stylish and sharp as opposed to stolid old-fashioned business wear but not so exaggerated as to become too pointy as I sometimes find some G&G stuff. I also admire the improvements in the fitting process (pressure pad and trial shoes) that G&G have implemented. Personally I don’t think that I can justify the price hike for bespoke vs high-end MTO especially if EG manage to fix a fit issue that I’m having on my first pair of top drawer which they seem very willing to look at but if money were no object then obviously bespoke is the way to go. When trying to build a decent collection however the two to three times price multiple makes a big difference. It does seem to me however that only a few improvements and innovations in top-end MTO could close the gap with bespoke appreciably for many people. The improvements that I’m thinking of are some modest fit customisations to standard lasts, potentially with a reasonably significant one-off cost, and some improvements in heel shaping on high-end MTO. I suppose that given G&G has a bespoke operation it might not be in their interests to close the gap too far but there would be no such conflicts of interest for EG. Maybe the volumes aren’t high enough to make it worth their while. It’s a good point Julian. That’s something St Crispin’s try to offer with their system. EG have talked about doing something similar, creating a new last or adjusting one for a client. But you do need a decent volume before it’s worth doing that at a reasonable cost. The vintage cedar makes up very nicely. These are beautiful and I think the combination of color and style make these an exceedingly versatile pair. Curious do you generally prefer soft square toe to a rounded one? I always notice on your shoes that the wear is very different from my experiences.You get no strong creases and there is not a blemish to be seen on the toe cap. I often find that distinct, strong creases develop on my shoes where my foot bends. How do you achieve this light wear? Do you use shoe trees? That helps with creases. Also cream will stop the shoes drying out, leading to hard creases. Scuffs etc on the toe can be dealt with by brushing at the end of every day, wiping briefly in the morning before wear, and polishing when there is something more permanent to deal with. Of these, the first is the most important. With the use of a 3D printer to create lasts. Small capital investment but could be innovative! Edward Green or others should look into it! Not sure that’s a great idea. Rivolta used a scanning technology to make a pair of bespoke boots for me and they were terrible (twice). Lodger also tried using it and admitted after six months that it was pretty useless. Nothing like a person and some handwork…. Fair enough, what about a My Left Shoe approach wherein they use a 3D scan to determine which last out of however many models would fit best? Can almost be done with an iphone its so simple! Another thing on that would be the craftsmanship. If I ever can afford to upgrade from mto to bespoke what I want is the experience of meeting the craftsman who works with you, the trial and error and the relationship. I don’t want a computer programmer making my shoes. Absolutely stunning shoes, and the trousers aren’t bad either. Gifted with low instep and narrow heel, I’d really wish to experience the snug fit around heel, ankle and instep you are describing. Sounds marvelous, however I’m afraid the price is an obstacle. But one can survive on one kidney though, am I right? My sole MTO from G&G in D width is a step in the right direction, compared to my E width from C&J, but not quite there yet. On a side note, the toe caps on my G&G are pretty different in shape and length. Is this to be expected? You wrote that these shoes are worn with grey trousers, as dark as mid grey, but not blue. I can see that the colour might not harmonise with navy, but what about lighter blue tones? Any other trouser colours you wear with these (vintage cedar?) shoes? I think I’m gonna have to save up for MTO St James II, which come pretty close in looks at least. Please keep up the good work. It makes me poor, but definitely more stylish. Lighter blues might be ok, but in my experience they rarely work. Any pale trousers would work – cream, tan etc. These shoes are amazing. I am looking to buy my first pair of black shoes (I’ve had a couple, but threw them away when i realized how ugly they were), and therefore have a quick question: I have brown cap toes, brown monks and grey suede tassel loafers. I really like the look of a well made wholecut. Is this something you would recommend as the first black pair? I am mostly going to use them in a business enviroment. Thanks in advance and keep up the good work with the blog! Could you spend a few lines addressing shoestrings, please? The ones here are lovely, and I’d like to know where to find truly premium shoe laces. Online stores aim to the masses, but for bespoke or high-end RTW, a step up is called for. Where to look, what to look for, in your opinion? Thanks. Sure George, I’ll do something soon. I notice that these are very similar to an Alfred Sargent pair. Is it a coincidence that Tony Gaziano spent a few years with AS or is this bespoke pair somehow a legacy of that design? A bit off topic here Simon, but what do you maintain the line in the middle (if it makes sense) of your trousers. Do you rotate and rest them or press them after every wear? To be honest I’m not great on that John. I have the suits pressed every few months and hang the trousers carefully afterwards, but that’s about it. I have purchased a couple of pairs of very nice G&G shoes and was wondering if I should get toe caps fitted to them. One pair I will probably wear once a week, the other probably less so (Chelsea slip-ons, so more casual rather than work). I would like these shoes to last as long as possible so thought toe caps would be a sensible investment to that end. I know that it depends on walking style and I notice that shoes I have worn perhaps 50 times are worn at the toe, to the point where the stitching is worn away. I presume that this means toe caps would make sense for me? I am slightly concerned about any clicking sound as I walk but presume it is simply something I must get used to. I appreciate any advice you can give. Yes, if the toes are wearing like that then caps would be a good idea. There has been a staggering price increase over the last 12 months. I was estimated a £4000 starting price yesterday for standard leather. Sadly thats now too rich for me. I’m currently trying to decide on some St James ii deco’s, but am having a challenge deciding on the colour. They’re for more smart casual situations and to go with mid grey flannel, khaki green and camel/beige trousers. Would you recommend vintage oak or vintage cherry? Vintage oak would be the most versatile (and my personal favourite colour). I’d go with that. Another unrelated question, I’m looking at getting some Bestetti wholecuts in a dark blue patina, but am unsure of how much they would go with. Do you think its a bit of a risk getting this type of colour? I think it is, yes. I have a dark blue pair from John Lobb and they rarely get worn. You want to buy Gaziano & Girling shoes? hey Simon. I was wondering why you haven’t tried the likes of Bestetti or Meccariello? I know you mostly buy bespoke footwear, but for MTO or ‘in between’, wouldn’t they be considered better value for money that G&G or Corthay etc (especially due to hand welting rather than gemmed Goodyear). Also, this is probably a more subjective question, but Ive always had difficulty justifying spending the same amount on suede shoes as calfskin as I see more value is calfskin. Do you know of others with the same view, or is it something you think someone should drop as quickly as possible? I’ve meant to try both shoemakers, but haven’t got around to it yet. I’m sure I will! It’s an interesting point on suede, and I know what you mean. But if you like a good suede shoe, it is a very rewarding thing – not as much to polish, obviously, but a soft reverse-calf does feel very luxurious. And of course it’s only one part of the value/quality in a shoe. How would you compare GG bespoke to say JL bespoke? I believe JL is a bit more expensive but I’m trying to decide between the two for my first bespoke pair and I’m torn! Yes John Lobb UK. But given that it’s a bespoke service, how relevant is their house style? Would it not be more about their craftsmanship and their bespoke service too? Even with bespoke, your selection should be very much informed by house styles. Not because they can’t make everything, but because creating an entirely new design, shape, toe etc is very risky. Much bigger chance you’ll end up with something you don’t like – or that takes a long time to perfect. OK, why are the socks green? In the photo on my computer they look more like a blue-green. But these is a message in there and I’s like to know why.